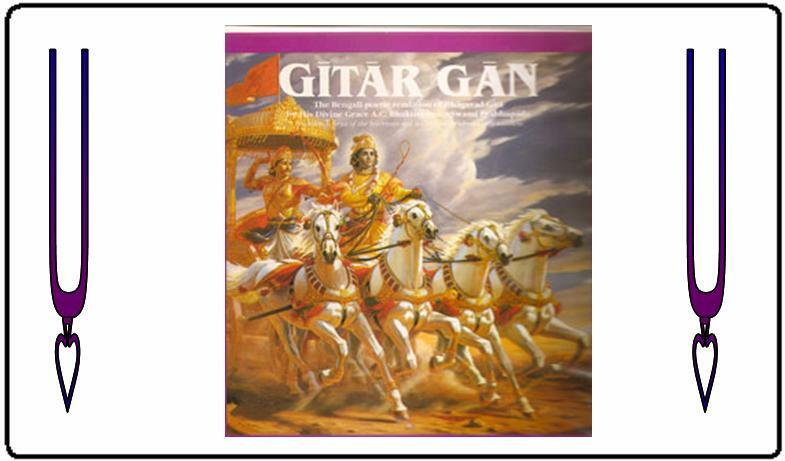 “Gitar Gan” or the “Song of the Gita” is the Bengali translation of the Bhagavad-Gita written by Srila Prabhupada. After translating the Gita into English with extensive authoritative commentaries, he communicated the Gita in a more simpler form through writing in Bengali poetic form. Despite having the Gita in a systematic poetic form, the Bengali poetic form resembles Bengali kirtan with different poetic styles. Even though Srila Prabhupada translated 718 verses (18 of his own chapter concluded verses plus the original 700 Gita verses), he stressed his disciples in reading his commentaries on original Vedic literature, rather than promote his own original works such as his bhajans.